Promethium has the symbol Pm. 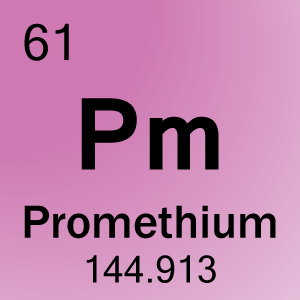 Promethium's atomic number is 61. The atomic weight is 145. The group name is Lanthenide Series. 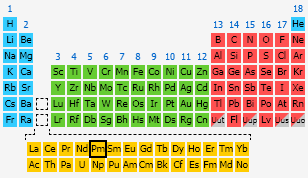 The period is 6 and its family is rare earth metals. Number of protons and electrons are 61. Number of neutrons is 84. It was found by the byproducts of uranium fission. It can be produced by bombarding Neodymim-146 with neutrons. Neodymium-146 becomes neodymium-147 when it captures a neutron. Neodymium-147, with a half-life of 11 days, decays into promethium-147 through beta decay. Promethium does not occur naturally on earth, although it has been detected in the spectrum of a star in the constellation Andromeda. It was predicted by Bohuslav Brauner, a Czech chemist, in the year 1902. Several groups claimed to have produced the element, but they could not confirm their discoveries because of difficulty of separating promethium from other elements. Proof of the existence of promethium was obtained by Jacob A. Marinsky, Lawrence E. Glendenin and Charles D. Coryell in 1944. They discovered promethium while analyzing the byproducts of uranium fission that were produced in a nuclear reactor located in Clinton Laboratories in Oak Ridge, Tennessee. 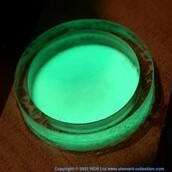 Promethium could be used to make a nuclear powered battery, also as a portable X-ray source, in radioisotope thermo electric generators to provide electricity for space probes and satellites, as a source of radioactivity for gauges that measure thickness and to make lasers that can be used to communicate with submerged submarines, with thickness gauges, luminous paint for watches, and luminous paints. Promethium got its name from a Greek god Prometheus, who stole fire from the sky and gave it to mankind. Authors: Maggie K. and Kirsten S.